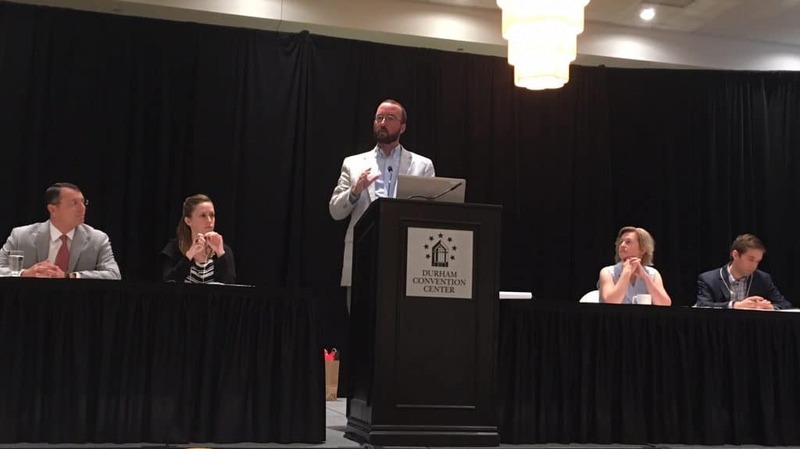 Allison Carr, Clean Transportation Specialist at NCCETC, talks about the 50 States of EVs reports. 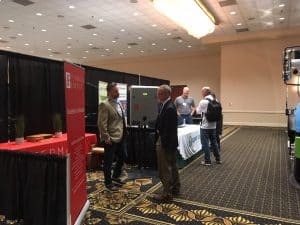 Fleet industry professionals, alternative vehicle experts, and sustainability advocates from around the country gathered recently for the 2018 Sustainable Fleet Technology Conference & Expo in Durham, NC. 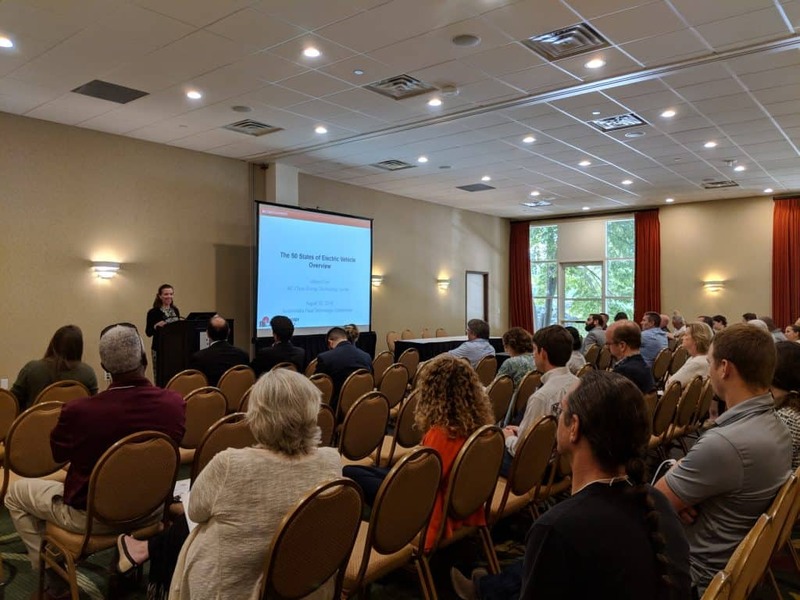 More than 50 speakers presented their practices and ideas at the two-day conference, including fleet managers, technicians, company presidents and CEOs, university professors, researchers, analysts, nonprofit managers and more. 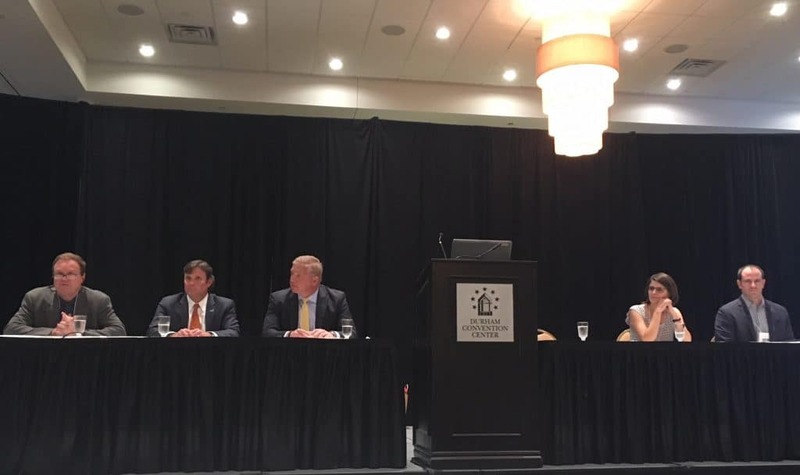 With all of the varying backgrounds in transportation, there seemed to be a definitive consensus on alternative fuels – whether electric, propane, biofuel or natural gas – the industry is moving forward, and the future looks bright. Tony Posawatz, the keynote speaker on day one of the Sustainable Fleet Technology Conference. 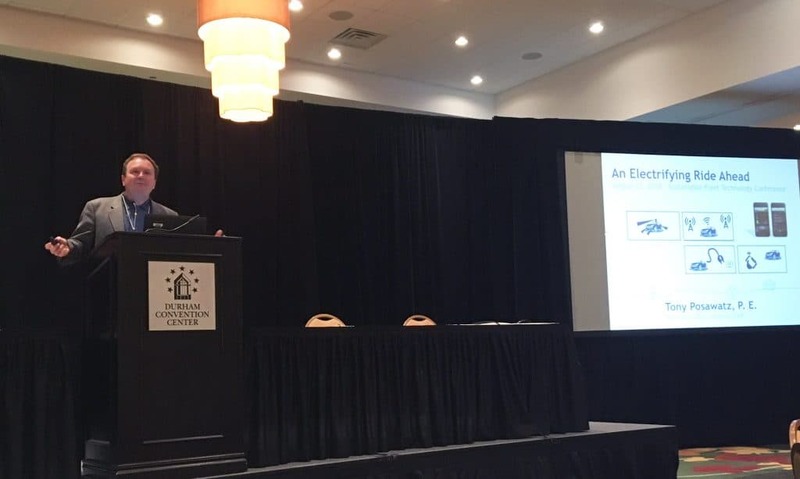 Keynote speaker Posawatz; who is recognized as an industry leader in product innovation and electrified vehicles as Vehicle Line Executive/Director for the Chevrolet Volt (and founding member), Avalanche, and Cadillac Escalade; kicked off the conference on Wednesday morning. 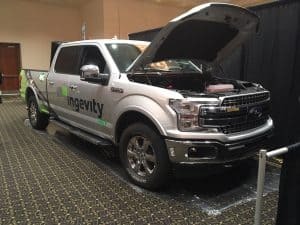 Posowatz noted the alternative fuel market has steadily risen each year, and more and more choices have become available to consumers. “It’s important for the industry to grow and for customers to be satisfied,” Posawatz said. Posawatz noted that while the industry is obviously improving, it’s still impossible to predict. Panelists speak at the Electric Vehicles breakout session, including Christopher Facente, Fleet Manager at UNC-Charlotte; Ben Prochazka, Vice President of Electrification Coalition; Jesse Way, Climate Policy Analyst, Northeast States for Coordinated Air Use Management (NESCAUM); Mark Goody, Manager of Electric Vehicle Programs at FleetCarma; and Whitney Schmidt, EV Charging Sales Director, Carolinas and Tennessee, ChargePoint. The three conference tracks included Connected Fleets, Alternative Fuel Solutions, Deployment and Lessons Learned, while 12 breakout sessions covered Predictive Analytics; Electric Vehicles; Solutions for Port & Freight; Smart Mobility; Propane; Local, State, Federal Policies & Resources; Managing for Fleet Efficiency; Biofuels; Sustainable Garage & Facility Operations; Smart Cities & Smart Grid; Natural Gas; and Idle Reduction. Future of Sustainability panel, left to right: Tony Posawatz, Stuart Weidie, CEO of Alliance AutoGas; Scott Phillippi, Automotive Maintenance and Engineering Manager at UPS; Loreana Marciante, Low Carbon Mobility Strategy Manager at Paul Allen Philanthropies; and Scott Curran, Oak Ridge National Laboratory. The first plenary panel, Future of Sustainability, featured Stuart Weidie, CEO of Alliance AutoGas; Loreana Marciante, Low Carbon Mobility Strategy Manager at Paul Allen Philanthropies; Scott Phillippi, Automotive Maintenance and Engineering Manager at UPS; and Scott Curran, Oak Ridge National Laboratory. 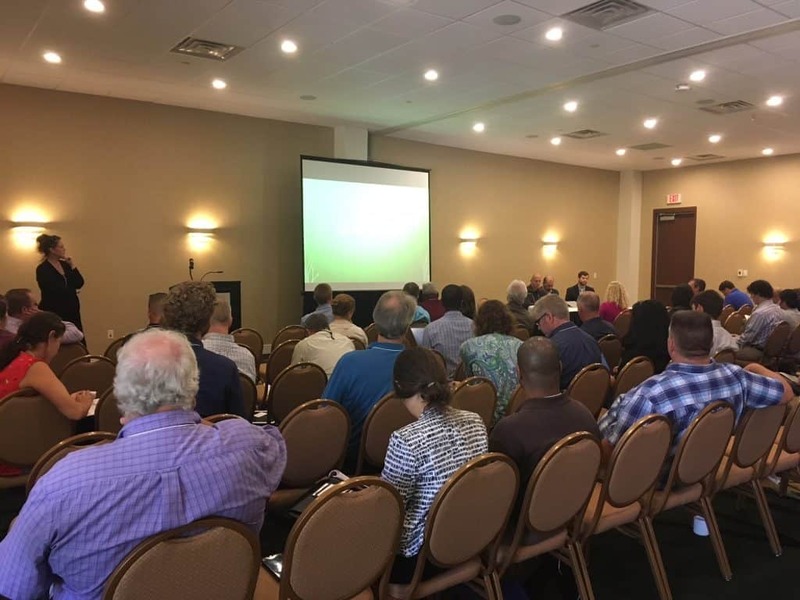 While the plenary panel all came from different backgrounds, they agreed each alternative fuel and technology has its place and application. VW Settlement Plenary Panel, left to right: Michael Abraczinskas, Director, NC Department of Environment and Natural Resources (NCDEQ); Alexa Voytek, Senior Program Manager of Office of Energy Programs at Tennessee Department of Environment & Conservation (TDEQ); Joe Annotti, Gladstein, Neandross & Associates (GNA); Debra Swartz, Michigan Department of Environmental Quality; and and Michael Buff, infrastructure team, Electrify America. At the VW Settlement Plenary Panel, Michael Buff of Electrify America; Michael Abraczinskas of NC Department of Environment and Natural Resources (NCDEQ); Alexa Voytek of Office of Energy Programs at Tennessee Department of Environment & Conservation (TDEQ); and Debra Swartz, Michigan Department of Environmental Quality; discussed settlement funds coming from Volkswagen. 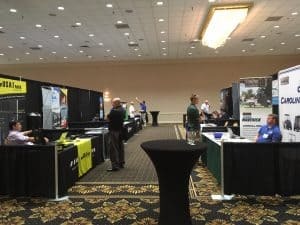 Over 40 exhibitors showcased their products, services, and vehicles in the Expo Hall. 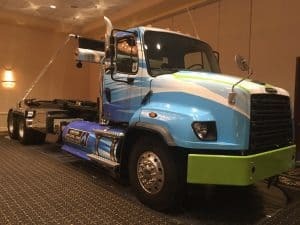 Plug-in and hybrid electric vehicles from Toyota, Mitsubishi, Chevy, and Chrysler were on display, as well as other vehicles fueled by natural gas and propane, including a heavy-duty Freightliner CNG trash roll-off hoist truck.